Link to page devoted to the Archaea. Link to illustrated discussion of the structure. reaction to the Gram stain. Although the Gram stain might seem an arbitrary criterion to use in bacterial taxonomy, it does, in fact, distinguish between two fundamentally different kinds of bacterial cell walls and reflects a natural division among the bacteria. More recently, genome sequencing, especially of their 16S ribosomal RNA (rRNA), has provided additional insights into the evolutionary relationships among the bacteria. C. tetani liberates a toxin that blocks transmitter release (by destroying the SNAREs needed) at inhibitory synapses in the spinal cord and brain. This interferes with the reciprocal inhibition of antagonistic pairs of skeletal muscles so the victim suffers violent muscle spasms. Fortunately, the disease — called tetanus — is now rare in developed countries, thanks to almost universal immunization against the toxin. Chemical alteration of the toxin produces a toxoid that still retains the epitopes of the toxin. Incorporated in a vaccine, the toxoid provides a relatively long-lasting (~10 years) immunity against tetanus. How pneumococci enter the body. 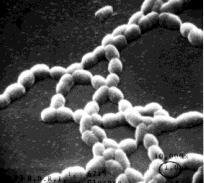 Streptococcus pneumoniae is the organism that led to the discovery that genes are DNA. Link to a discussion. Mycoplasmas have the distinction of being the smallest living organisms. They are so small (0.1 µm) that they can be seen only under the electron microscope. Mycoplasmas are obligate parasites; that is, they can live only within the cells of other organisms. They are probably the descendants of Gram-positive bacteria who have lost their peptidoglycan wall as well as much of their genome — now depending on the gene products of their host. The scientists at The Institute for Genomic Research (now known as the J. Craig Venter Institute — JCVI) who determined the Mycoplasma genitalium sequence followed this work by systematically destroying its genes (by mutating them with insertions) to see which ones are essential to life and which are dispensable. Of the 485 protein-encoding genes, they have concluded that only 381 of them are essential to life. Workers at the JCVI have also succeeded in synthesizing the complete genome of one species of mycoplasma, inserted this into a second species, which converted the second species into the first. Read more about this remarkable achievement. Most of these Gram-positive organisms grow as thin filaments — like a mold — rather than as single cells. In fact, they were long thought to be fungi and were called actinomycetes. But fungi are eukaryotes and the actinobacteria are not. How the tubercle bacillus enters and lives in cells. Treatment of the toxin with formaldehyde converts it into a harmless toxoid. Immunization with this toxoid — usually incorporated along with tetanus toxoid and pertussis antigens in a "triple vaccine" (DTP) — protects against the disease. 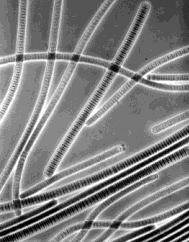 This large group of bacteria form a clade sharing related rRNA sequences. They are all Gram-negative but come in every shape (rods, cocci, spirilla). They are further subdivided into 5 clades: alpha-, beta-, gamma-, delta-, and epsilon proteobacteria. Rickettsias. These bacteria are too small to be clearly seen under the light microscope. Almost all are obligate intracellular parasites. This means that they can only grow and reproduce while within the living cells of their host — certain arthropods (ticks, mites, lice, fleas) and mammals. The mitochondria of eukaryotes probably evolved from endosymbiotic bacteria. Because of the similarities of their genomes, rickettsias appear to be close relatives of mitochondria. Link to discussion of the endosymbiotic theory of the origin of mitochondria. Link to data on genomes of R. prowazekii and mitochondria. They then use this energy to reduce carbon dioxide to carbohydrate (like the photosynthetic purple sulfur bacteria). Link to discussion of the various roles that bacteria play in the nitrogen cycle. How N. gonorrhoeae evades host immunity. Escherichia coli. The most thoroughly-studied of all creatures (possibly excepting ourselves). Its entire genome has been determined down to the last nucleotide: 4,639,221 base pairs of DNA encoding 4,377 genes. Lives in the human colon, usually harmlessly. However, water or undercooked food contaminated with the O157:H7 strain has caused severe — occasionally fatal — infections. How Salmonella typhi gets into human cells. over 700,000 people ill and caused over 6,000 deaths. Yersinia pestis. This bacillus causes bubonic plague. It is usually transmitted to humans by the bite of an infected flea. As it spreads into the lymph nodes, it causes them to become greatly swollen, hence the name "bubonic" (bubo — swelling of a lymph node) plague. Once in the lungs, however, the bacteria can spread through the air causing the rapidly lethal (2–3 days) "pneumonic" plague. Untreated, ~30% of the cases of bubonic plague are fatal, and the figure for the pneumonic form reaches 100%. The recurrent epidemics of the "black death" in Europe from 1347–1351, which killed off at least 30% of the population, was caused by this organism. DNA sequencing of samples retrieved from the bodies of plague victims of that era confirm this diagnosis. Although no major epidemics have occurred in this century, the threat is not entirely over. Yersinia pestis still flourishes in some rodent populations in the western U. S. and causes a dozen or so cases of human plague — primarily among small game hunters — each year. Like green plants, these bacteria are photosynthetic, using the energy of sunlight to reduce carbon dioxide to carbohydrate. Unlike plants, however, they do not use water as a source of electrons. Photosynthetic bacteria contain special types of chlorophylls (called bacteriochlorophylls) incorporated into membranes. With this machinery, they can run photosystem I but not photosystem II (which explains their inability to use water as a source of electrons). Link to a discussion of green plant photosynthesis and photosystems I and II. Most photosynthetic bacteria are obligate anaerobes; they cannot tolerate free oxygen. Thus they are restricted to such habitats as the surface of sediments at the bottom of shallow ponds and estuaries. Here they must make do with whatever radiant energy gets through the green algae and aquatic plants growing above them. However, the absorption spectrum of their bacteriochlorophylls lies mostly in the infrared region of the spectrum so they can trap energy missed by the green plants above them. 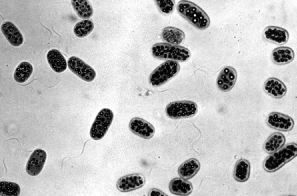 There is now lots of evidence that both of these eukaryotic organelles evolved from once free-living bacteria. that took up an endosymbiotic way of life in the ancestors of the eukaryotes. Link to a discussion of the endosymbiosis theory of the origin of eukaryotes.